On Florida's Space Coast, Gingrich Aims For The Moon During a campaign stop on Florida's Space Coast, Republican presidential hopeful Newt Gingrich promised a permanent moon base within eight years if he's elected. The self-described space nut says his plans would provide a boost to the region that's been hit hard by the recession and the U.S. space program's uncertain future. "I come at space from a standpoint of a romantic belief that it really is part of our destiny, and it has been tragic to see what has happened to our space program over the last 30 years," Gingrich said Wednesday in a crowded hotel ballroom in Cocoa, not far from the Kennedy Space Center. If elected, Gingrich promised, "by the end of my second term, we will have the first permanent base on the moon, and it will be American." His plan for "constant energetic and excited activities" would draw people back to the Space Coast, he said. "Because it's exciting and it's dynamic, and who knows what next week is going to be like? Does that mean I'm a visionary? You betcha." Later, at a roundtable with business leaders and educators, former shuttle pilot Mike McCulley recalled that President George W. Bush outlined an ambitious space agenda, which went nowhere. President Obama has also proposed a program much like Gingrich's that would use commercial rockets to carry cargo and crew to the International Space Station. McCulley said he might quibble with a few of Gingrich's details, but at least it's a vision. "It's been three or four major programs that have consumed enormous amounts of energy and money and time, and here we sit eight years later without a hell of a lot to show for it. I can say that, now that I'm retired, of course," McCulley said. 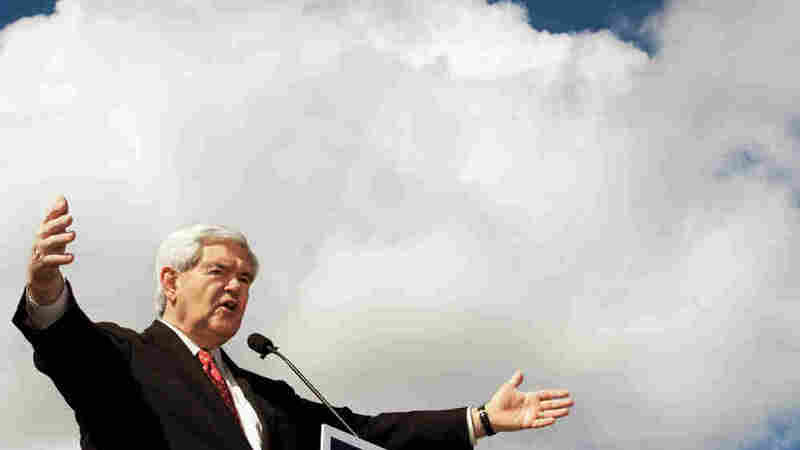 The former House speaker's space plan is a classic Gingrich big idea. Whether he would be able to sell it to debt-weary taxpayers and Congress, to say nothing of whether it would succeed, can only be guessed. "I was attacked the other night for being grandiose," Gingrich said. "I just want you to know: Lincoln standing at Council Bluffs was grandiose. The Wright brothers going down to Kitty Hawk was grandiose. John F. Kennedy saying we'll get to the moon in eight years was grandiose. I accept the charge that I am an American, and Americans are instinctively grandiose because we believe in a bigger future." Heading into next week's Florida primary, Gingrich conceded that rival Mitt Romney has made fun of his space ideas. But Gingrich says he is a romantic, while Romney is only practical.